As someone who considers restaurant-going a favorite pastime, I often skip the Maryland suburbs and head into DC. These days, however, Bethesda is coming into its own. 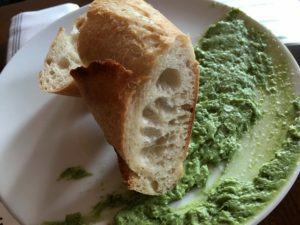 Duck Duck Goose is one of the newer arrivals, bringing a playful take on French cuisine to Woodmont Triangle. The 28-seat no-reservations brasserie is bustling on a recent weeknight. It’s a pump-up-the-volume kind of place, with music blaring and cocktail glasses clinking. An outside patio fills quickly, and I wonder if conversation is any easier on the busy street. I ignore the sound level with the assistance of a Loosey Goosey cocktail – a whimsical blend of tequila, orange juice, honey, elderflower, mint, and candied ginger. Duck Duck Goose has a roster of creative small plates and mains that are primarily fish- or as the name suggests- fowl. Close attention is paid to presentation, with well-balanced slices of complimentary bread and ramp butter setting the scene from the start. 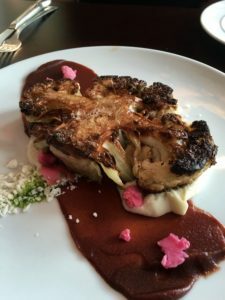 Cauliflower steak is a highlight from the “smalls” portion of the menu. Cauliflower is charred, pickled, and fashioned into make-believe couscous. A purée of dates is a sweet touch. Tuna is done well with a thin outer crust and a pink interior. It’s nestled on the edge of the plate, where its fuses with avocado purée, English cucumber, sea beans, and piquillo pepper. 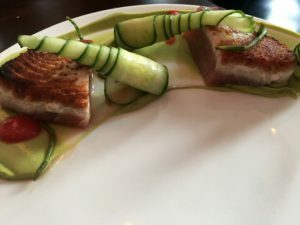 The plating of this Duck Duck Goose dish conjures up another long-forgotten children’s game- Lincoln Logs. I would eagerly welcome the “small” squid ink spaghetti as a medium or large. It’s got just the right amount of zing from a sprinkling of pickled chilies, and clams add interest to round it out. 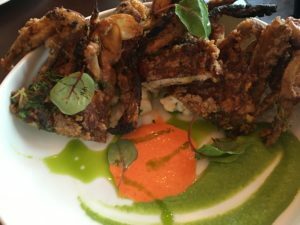 Soft shell crab with green goddess puree and piquillo pepper coulis is a well conceived dish that is just shy of perfection. Its lost its crispness somewhere along the way. Flavorful summer succotash puts it back in the game as a desirable main. Duck Duck Goose is the second venture for Chef/owner Ashish Alfred, who also owns 4935 Kitchen and Bar down the street. 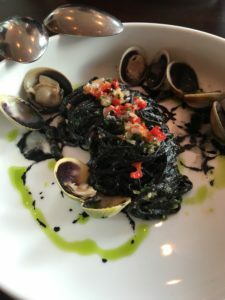 In Duck Duck Goose he has created a fun vibe and a restaurant that wins me over with attentive service and delectable dishes.